“And when he had gone a little further thence, he saw James the son of Zebedee, and John his brother, who also were in the ship mending their nets” (Mark 1:19). James and John were fishermen; it was their profession; they did it for a living. They knew there were fish in the sea and they knew if they were to be successful, they would have to have their nets in good condition, no holes for the fish to escape back into the sea. It took diligence to keep the nets in ready condition; ready to drop whenever they discovered a school of fish. That was why they were in the ship, to catch fish, and they came prepared. “And he goeth up into a mountain, and calleth unto him whom he would: and they came unto him” (Mark 3:13). When the call comes from Jesus, we have to heed the invitation and “come,” bringing all our old baggage and drop it at the feet of Jesus to be either discarded or recycled by Him. This enables us to become “fishers of men” in whatever capacity or profession the Lord has chosen for us. Jesus called James and John from the ship to an enhancement of their profession. From now on they would be fishers of men. 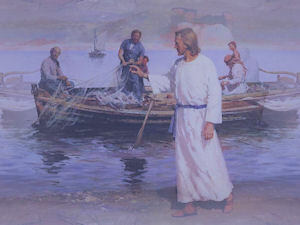 When he called them from the fishing ship and nets, He put them right to work for Him in His Kingdom. 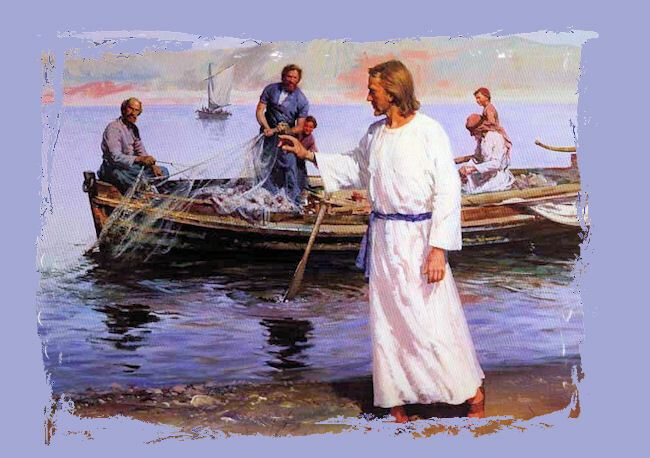 They would be entrusted with the important and delicate task of catching the “fish” that the Holy Spirit would bait and draw into the “net.” It would be their responsibility to keep their nets mended and ready to bring them to shore. Any broken strands of the net would allow them to escape, maybe forever and never be caught. The ”bait” the fishers were to use was Jesus, Himself. Later in one of their training sessions, Jesus told them, “And I, if I be lifted up from the earth, will draw all men unto me” (John 12:32). The Holy Spirit would use Jesus to draw the “fish,” and the fishermen would control the nets and pull the nets into the lifeboat, bringing them to the Father. “The fruit of righteous is a tree of life; and he that winneth souls is wise” (Proverbs 11:30). There would be times when the fishers of men would have to dig a hole in the ice to drop the bait (Jesus) in order to catch the fish. They were met with fierce icy resistance at some locations and even encountered ice so thick that they had to leave and go to another place. Other times, it seemed that the fish were just waiting eagerly for the net to drop and pull them in. Every where they went, they carried their nets, always prepared. Their preparation might lead them to the dungeon of a prison after having been tried for being “fishers of men” as they sang and lifted up praises to the One who called them to this new job. Their commitment to their calling led some of them to their death while looking into the heavens and observing the Master Fisherman waiting for their entrance into the Heavenly Palatial Palace. Have all the fish been caught? Absolutely not! This momentous job was passed to the next generation after another to our time. We are the current “fishers of men” to our generation. The “bait” is still the same, never altered. Though the fishing methods have undergone many changes down through the ages, the basics are the same: The Holy Spirit draws the fish with the “bait” of Jesus Christ; and the net is dropped by the fishers of today, using whatever method the Kingdom Head has chosen. There is a great sea of fish just waiting for the modern day fishers to mend their nets, the Holy Spirit to supply the bait, and the full net to be drawn into the boat and safely brought to shore. What would damage our nets, making us ineffective? It could be discouragement from unsuccessful fishing ventures in the past; we tried and failed and Satan says, “Why try? You are tired; you tried; you did your best.” It could even be cynicism. We look around and see all the ungodly things happening and begin to feel that it would be hopeless to try and change things/people. Or maybe it’s just plain neglect. We neglect communion with our Heavenly Father and His Word. We drift a little farther away each day that we don’t meet with Him and renew our mind with His Word. Another damaging problem can be impatience. Any good fisherman knows that it takes patience to sit on the bank or in the boat with his line in the water, waiting, waiting for the strike. When he feels that pull on his line, he becomes alive and goes into action to bring his catch to the shore or his boat. There’s that word again—patience (persistent perseverance). If God shows us a ‘fish in our pond,’ remember that He has supplied the ‘Bait,’ and then we with patience wait for the strike. Without patience, we could drive it away and make it bait-shy and harder to land in the future. “…Well done, thou good and faithful servant: thou hast been faithful over a few things, I will make thee ruler over many things: enter thou into the joy of thy lord.” (Matthew 25:21). May our generation of fishers become more effective and the venture the most successful fishing expedition that this world has known! The fishing season may be coming to a close. Music: "What A Lovely Name"